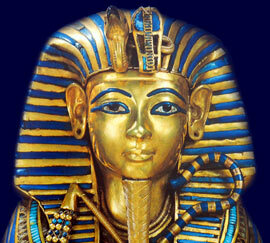 The type and style of the home of an Ancient Egyptian was dictated by the wealth of the owner. The style of the houses and villas was made practical for the hot weather in Egypt. The earliest homes in Ancient Egypt were made of reeds with a shape similar to a beehive. However as time went on the main materials used to build the houses and villas in Ancient Egypt were mud bricks, although sometimes stone footings were used as a basis for the houses of the wealthy to reduce the damp which resulted from the flooding of the Nile. The mud bricks used in the building of Ancient Egyptian homes were of a standard size measuring 30 x 15 x 8cm ( 12 x 6 x 3 inches). Windows were high up to keep out the sunlight, windows were rectangular in shape and quite small. Glass was not added to windows, they were simply covered with linen. As a result the houses in Ancient Egypt were quite dark. The outside and inside of the houses were coated with a white wash ( a white limestone plaster ) which helped to deflect the fierce heat of Egypt. The walls of the wealthy were painted with various scenes reflecting Ancient Egyptian life. Wood and tree trunks were used as supporting beams and columns, covered in plaster and painted. The roofs were low and flat which were sometimes used for cooking and for sleeping. The houses of the poor Egyptians were small, dark and cramped which were often shared by many people. The main living area doubled as a bedroom. The kitchen area was often placed on the upper storey although cooking was also conducted on the roof. The interiors were very basic with limited furniture and simple white washed walls. There were no bathrooms for washing and no lavatories, other than a pot filled with sand. Animals often shared the living quarters of the poor Egyptians. The Ancient Egyptians used lamps for their lighting. The most common type of lamp were made from pottery or stone bowls containing palm-nut oil. The wick was made of flax or papyrus. In the wealthy households a sprinkle of salt would be added to reduce the smoke emitted. The length of the wicks were an extremely useful way of indicating the time. It is known that the wicks of the lamps used by the tomb builders were designed to burn for periods of 4 hours. When a lamp went out this indicated the time for a break. There were also highly ornate and elaborate lamp stands often shaped like columns and varying in length. The wealthy Ancient Egyptians did not have running water but they still had bathrooms. The equivalent of a shower room, or wet room, consisted of a stone slab on which the person would stand where water was poured over them by a body servant. Water was precious in Egypt and the waste water drained out of the room via a pipe where the water was deposited in a large jar. The water would have then be used for watering the garden. The lavatories or toilets consisted of a wooden seat supported by bricks which had a pot filled with sand underneath.